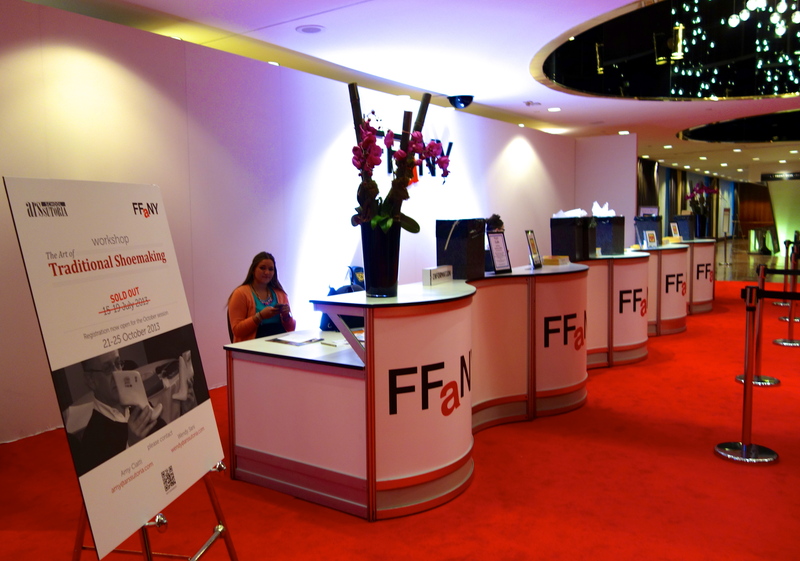 This week I attended the Fashion Footwear Association of New York (FFANY) Shoe Show 2013 in midtown and was in shoe heaven! There were plenty of shoes from over a hundred brands and the suggested retail price for many of them were well within reason. New York showrooms were open this week for market as well. Shoe lovers, get in here! I whirled through three floors of shoes and my favorite and the funkiest shoe was from J.C. Dossier. But as these shoes are not on the market yet and knock-off brands are rampant, I won’t be able to share them with you. I can tell you, however, that they were some of the most creative, kooky and colorful wedge heels I’ve ever seen! They will be in stores soon. Apart from those, I adored a pair of Kiss & Tell blue ruffled booties (pictured below), a pair of NYLA orange spiked sandals (above), and several from Six London (may have photos soon). I also ran into Ivy Reyes of Luichi NY, a fellow FITer, who showed me some new dark blue python shoes (below) with a high-backing, apparently a big trend for the upcoming season. London Trash also had several shoes with a high-back (pictured below). Wedge sneakers, spikes, high-rising heels (like London Trash above) and sequins seemed to be dominant trends at the Show. 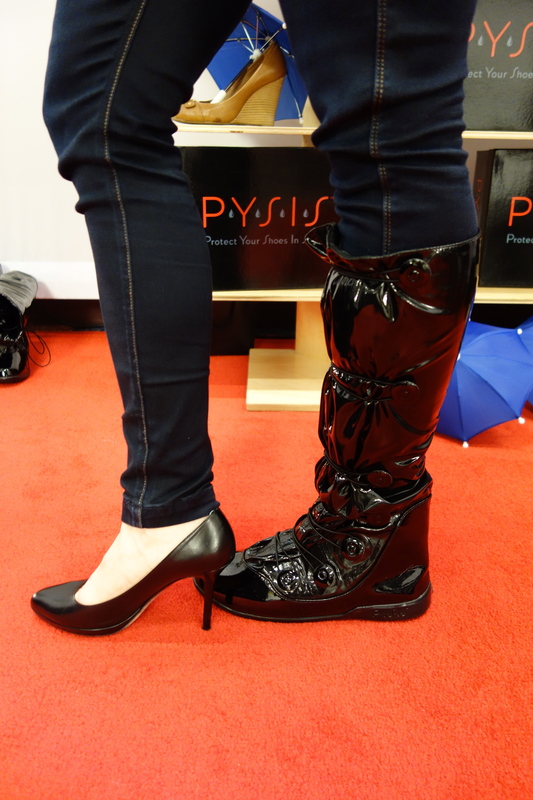 The most innovative pair of shoes were from Cassandra Droogan of Protect Your Shoes In Style (PYSIS). She created a pair of boots that will go over your expensive pair of heels if you happen to be out in unfavorable weather conditions. Seems like a solution to me, instead of trying to change shoes all the time. I did not try them on but Cassandra modeled them below. I also ran into Melissa Tierney, FFANY Social Media Chair and Creator of Look 4 Less, a page about putting a look together on a budget. 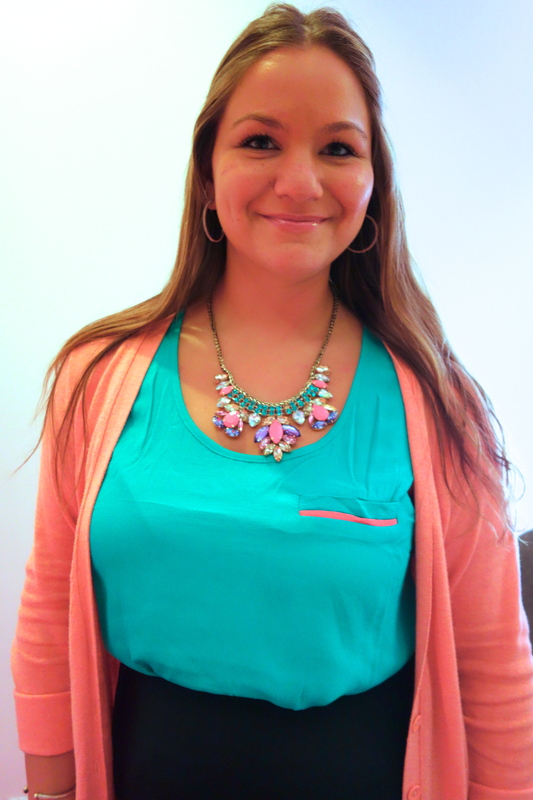 I was struck by Melissa’s necklace and pretty blouse who told me she got them from Target and H & M for about five dollars. I was wearing a white leather and linen Vince jacket, blue Kelly Wearstler skirt, my Giuseppe Zanotti pumps and a white blouse from H &M.